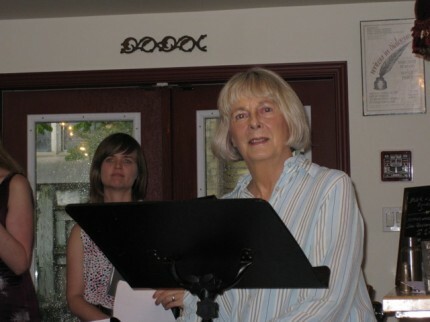 On Thursday June 7th, Canadian author Susan Swan and the all girl folk-noir quartet, the Billie Hollies, delighted a packed house at The Toronto Women’s Bookstore with the forty-minute performance reading: Heroines of the Sexual Gothic. Why celebrate? Because the Toronto Women’s Bookstore is back and better than ever with an array of new features: an Espresso bar and lounge, summer patio, writing workshops as well as a reference library of important feminist and queer theory texts. The store also sells books for university courses in these disciplines. The first writing workshop will be led by Toronto fiction writer Zoe Whittail. The new owner Victoria Moreno explains that the new features have been designed to make her store more community oriented, and she encourages visitors to drop in for a coffee and browse. During the event, Swan discussed her intimate relationship with three of her best-known characters, including Mouse Bradford, who appears in The Western Light, Swan’s new novel, which will be published early this fall. The Billie Hollies are popular newcomers to the Toronto music scene. Their latest CD is Light of Mind. Thank you to all who came to the event and everyone that helped make it such a success.